If you’re living with irritable bowel syndrome (IBS) you’re not alone. In fact, IBS affects up to 1 in 7 Americans, so chances are you may know someone who is going through the same thing. Despite it being so common, many people living with IBS are unaware that their symptoms indicate a medically recognized disorder, which is why April has been named IBS Awareness Month, to increase recognition for this common condition. Coping is hard because you have to rigidly stick to a bland diet which causes constipation, so I take a half dose of Miralax daily. I follow a bland diet most of the time. I like raw fruits and vegetables and cereal. Pasta with butter and Parmesan cheese is always a good choice. I NEVER eat spicy food and I stay away from raw onions. Miralax works wonders for me. I take it every day and this keeps me regular. I personally don’t take any meds. I watch my diet very carefully. I do try to stay away from spicy food and corn. I don’t go completely without corn however I know if eaten it will cause a lot of issues. I also bounce between having the diarrhea and constipation. It is a very frustrating vicious cycle. The best thing that I have ever done for my IBS was high-dosage Xifaxan. I convinced my doctor to prescribe me this after reading a book entitled A New IBS Solution. I took Librax for years, until I discovered Bentyl (which they gave my mother IV in the ER when she had an emergency attack of IBS). It comes in pill form, too, and IT WORKS. It almost completely controlled my IBS issues. There are lots of different ways to manage IBS, from prescriptions to dietary changes and more. 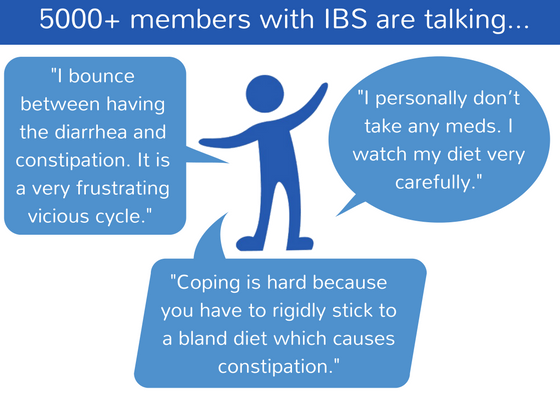 Did you know there are currently more than 5000 members on PatientsLikeMe living with IBS? They’re talking about their symptoms, finding support from others in the forums, sharing the treatments they’ve tried and tracking how those treatments are impacting them. Join the conversation on PatientsLikeMe. So glad to have found your blog. I’ve been diagnosed with IBS recently and am now living on a low FODMAP diet. Life haven’t been easier since then. It just feels better to know that I’m not alone on this fight..
Just found your blog. I’ve been on the low FODMAP diet for 2 weeks now since I was diagnosed with IBS. Thanks for this helpful post! It’s encouraging to know we’re not alone! Thanks for sharing! Good luck to all our low fodmap journey!